This mural is based on a small 2′ x 2′ painting I made in 2007. That painting and this mural are both called “Free Rain” which is an intended play on the notion of a liberating and free-rein of metaphysical perception. But I also see the abstracted shapes in the painting as rain-like, though it is equally valid to see these shapes as suggesting other objects in the physical world. As rain I see the shapes “falling” in four directions; up, down, side to side. Why not? And it’s not that rain can or can’t do that. It’s that (metaphysical and physical) nature can form many patterns that represent our metaphysics and collective unconscious, and that nature and metaphysics are always in dialogue with each other. And therein lies the poetry of life and what art is supposed to represent. 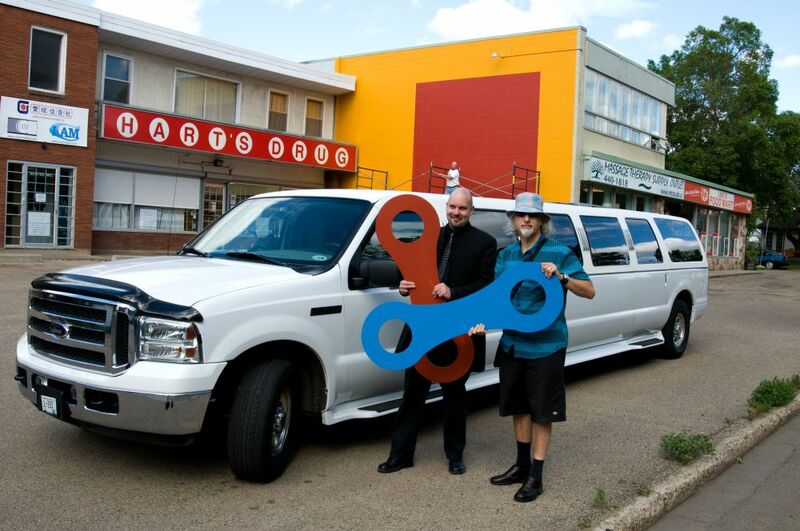 Challenge to communities from Edmonton-Goldbar representative Hugh MacDonald to initiate more art projects like this one in Strathearn. James K-M, the painter who created the image “Free Rain” which became the Strathearn mural talks about the work at the opening. Graham worked on the template and execution of the mural, Free Rain. At the opening he shared some thoughts about the mural. 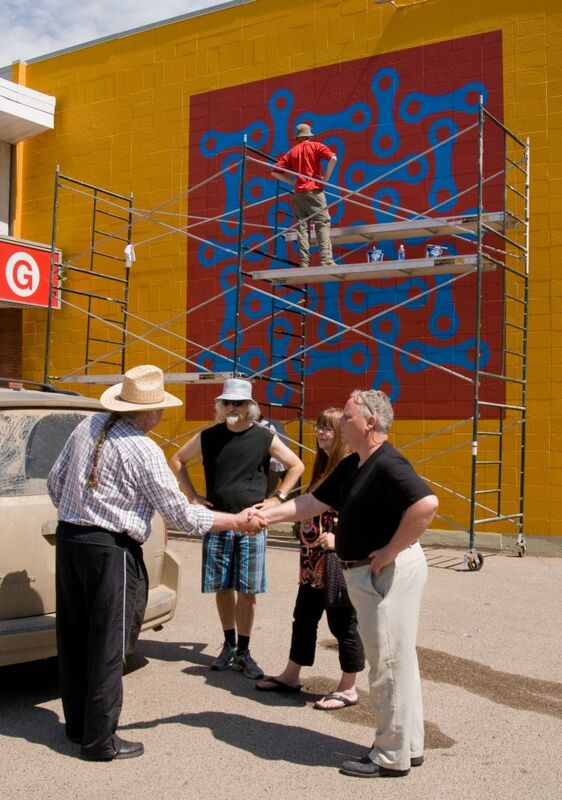 Mike MacLean was part of the team that executed the fine work on the Strathearn Mural project in Edmonton. Here he talks about it at the opening. He’s also a host of the weekly “Liquid Chatter” show on CJSR. Photographer Ron Snider documented the creation of the mural, on the website slideshow. Here he talks about the project as he saw it. Joe Clare commissioned the project, and brought together the team of people who produced the Strathearn mural. 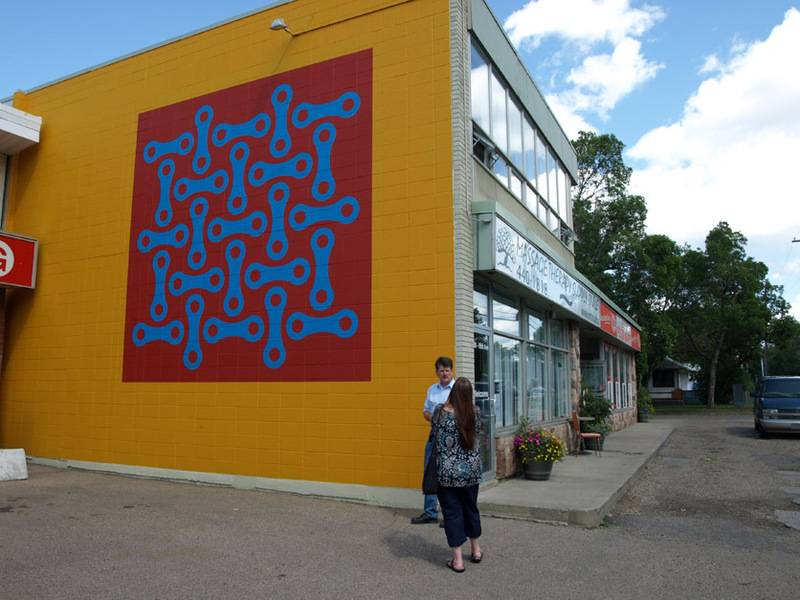 In this video, Edmonton architect, David Murray, discusses the Free Rain mural in Strathearn at the opening July 19, 2009. After the smudging, the owner of the pharmacy came over, concerned about everyone being in the parking area, and he even called the police. Meanwhile, the mural was revealed. Opening talks from Joe Clare and James K-M, with smudge ceremony from Leonard Cardinal of the Enoch Cree Nation. They told me when I arrived in Edmonton about a week ago that it wouldn’t rain until the mural was finished, and, in fact, the last brush stroke went on yesterday afternoon. Edmonton sure got lots of free rain, and wind, last night and today. And, you may know, that the name of this mural is Free Rain. I see the abstracted shapes in the painting as rain-like, though it is equally valid to see these shapes as suggesting other objects in the physical world. As rain I see the shapes falling in four directions; up, down, side to side. There’s a few people that I’d like to thank, first and foremost Joe Clare. Joe, you have my utmost respect and admiration for your persistent and selfless creativity and generosity and which led to giving this mural to the people of Edmonton, and beyond. Thank you Joe. Those of you who really know Joe Clare know that he also lives quite a rigorous life, and he surrounds himself with like minded people who I’ve had the priviledge of working with on this project, namely Graham Burns and Mike MacLean. They worked tirelessly and sometimes from early morning to sundown and are mainly responsible for the precision and labour of love you see here today. My profound thanks to you Graham and Mike. And to Ron Snider who was always available and photographed every little step of the way so you could all follow the process as it unfolded. 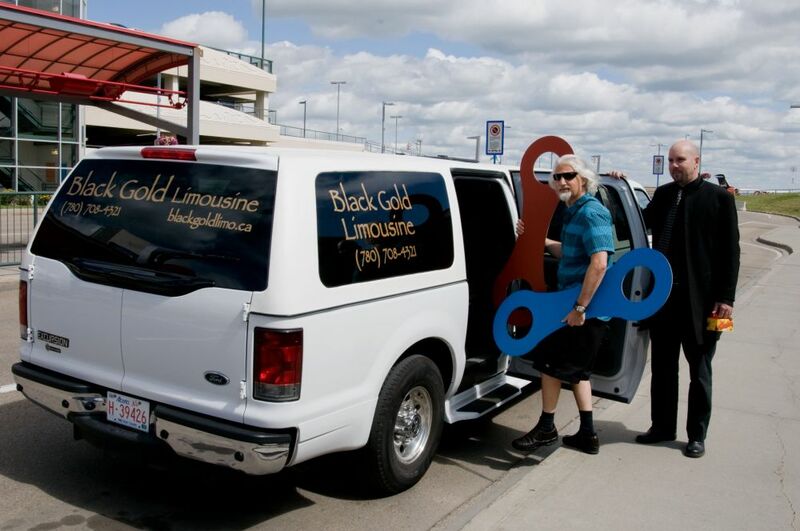 Thanks also to John of Black Gold Limousine who picked me up from the airport in high style. Also, to my wife Carol for your love. Finally, I want to get personal and mention a debt that I have to the Native people who we live beside wherever we are. I stopped painting in the late 80’s and worked with digital art until about 3 years ago. What precipitated my return to painting in 2006 was an extended visit to the Blood reserve in Southern Alberta which was followed by some very meaningful dreams. These dreams usually included Native Elders who directed me back to painting, in no uncertain terms. I am grateful that, as a result, by returning to painting, I’ve managed to retrieve my own physicality. To quote the irrepressable Marshall McLuhan who was born here in Edmonton, “a culture which loses its physicality breeds serial killers.” Please make of that what you will. 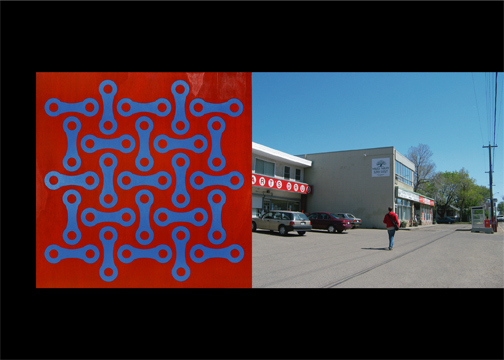 Since 2006 I’ve had two solo exhibitions both of which were officially opened by a Native representative of the region. Today we have invited Leonard Cardinal, an Elder from the Enoch Cree Nation who will now perform a smudging ceremony. Welcome Leonard Cardinal. In wind and free rain the team prepares for the opening at 3 that afternoon. Leonard Cardinal, Enoch Cree Nation Elder, agrees to smudge the building at the opening. In preparation for the opening tomorrow, Enoch Cree Elder Leonard Cardinal shakes hands with Joe Clare, while talking with James K-M and Carol Sill. In the background, Mike MacLean does touch up work on the mural. Graham Burns, Mike MacLean and James K-M move the scaffolding into place for the final touch-ups on the Strathearn Mural, on the day before the opening. 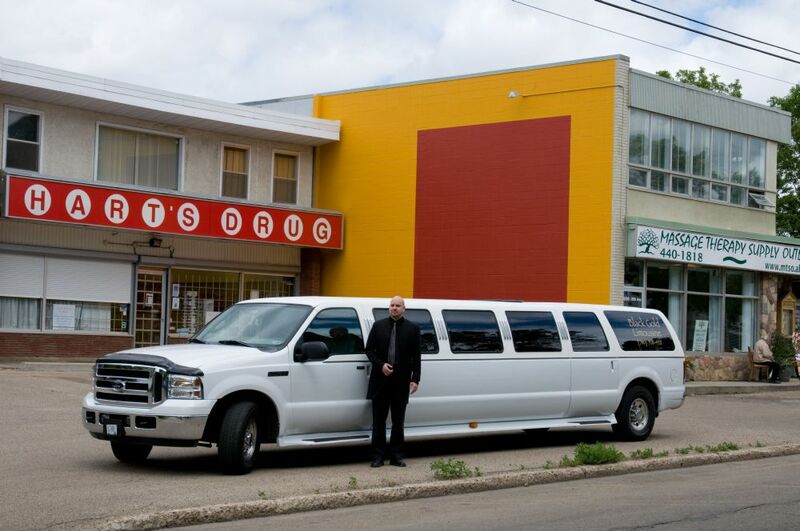 Thanks to John of Black Gold Limousine for his generous support, offering limo service for James’ arrival.